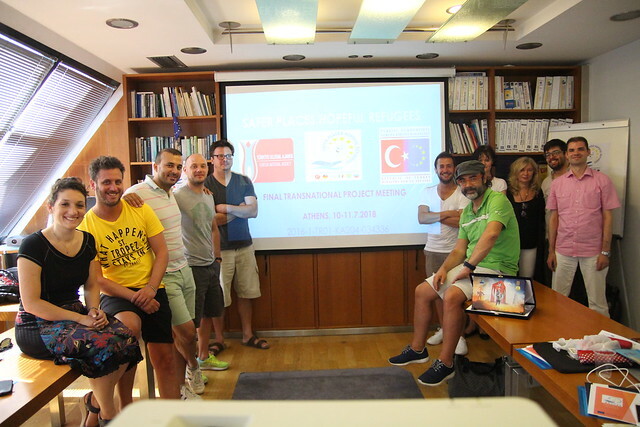 The final meeting of Safer Places Hopeful Refugees took place in Athens. Partners from Turkey, Germany, Sweden, Slovenia and Italy joined the host organization Action Synergy at their premises. The aim of the final meeting was mainly to reflect on the results of the project after two years and four training weeks in four different countries. It was also important for the partnership to discuss on the political situation in Europe and how this affects refugees. Because the situation from when the project started has unfortunately gotten worse. This means that future projects must, as the consortium did in SPHR, take into consideration the situation and see how they can improve it. All partners had the chance to present all the activities they did during those two years. Activities that involved language courses for refugees, health seminars, transnational training weeks to stakeholders, networking with NGOs and research through questionnaires and interviews. The partnership discussed on what the next steps should be in order to continue to contribute to the significant issue because refugees are not numbers but human beings and should have a chance to live an equal life with everybody else.